Nowadays, most of the companies are busy in making their support service facility as perfect as possible as it is considered to be the highest badge of merit among customers. For them, customer support is even more important than product quality and low pricing. Companies are trying to take it to the next level, only to stay ahead in the highly competitive market. Here, I have given some of the great examples of excellent customer service. Let’s read on for the top stories of how several companies had gone the extra mile for their customers. This story is about a loyal customer of Pizza Hut who used to order pizza regularly from there. Suddenly he went outstation for some purpose. The Pizza Hut branch was so concerned about his well being that they called him only to ask if he was fine as he didn’t order anything from them for more than two weeks. 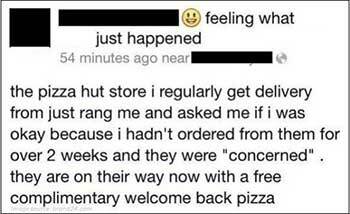 They also offered him a complementary ‘Welcome Back’ pizza. That customer was so happy that he shared this story on Facebook. This is undoubtedly one such example of good customer service. Zappos is a well-known online shoe and clothing store based in Las Vegas. It has become a rock star among customers for its extraordinary customer support. Let me share a story here. A customer bought a pair of shoes from them but forgot to carry it during her trip to Las Vegas. Then she tried to order a replacement pair of the same shoe from Zappos, unfortunately by that time, it went out of stock. But still, as they are headquartered in Las Vegas, Zappos tried to find out the same shoe in local malls. Surprisingly they found it and delivered that to the customer free of cost. A 10 year old girl lost her LG E400 phone and wrote an announcement with a request to help her in finding that. People discovered that handwritten publication on internet and started sharing it on social media. It spread so widely that even the producer of LG found it. What the company did is really nice. 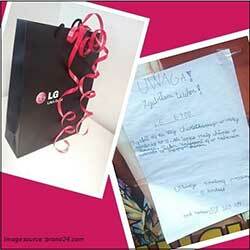 They gifted her a brand new LG Swift L3II. 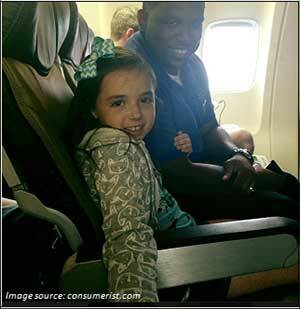 The mother of a nine –year-old girl, named Gabby, shared her recent experience with Southwest airlines on Facebook by posting a photo of her daughter with a crew member named Garrick. She noted specially that her daughter is a type 1 diabetic and also suffers from severe flying anxiety. She shared that, when one of the crew member named Garrick saw that Gabby got scared, he did all the possible things to make her comfortable. He spoke to her, tried to make her laugh, and brought special drinks to make her busy with all other things. But when the plane hit some kind of turbulence, she started having some sort of panic attacks. Then, Garrick made her sit with him and they discussed about other things like Garrick’s little daughter, her hobbies etc. Upon arrival, Garrick announced that Gabby had finally overcome the fear of flying and asked for a round of applause. Overall, Gabby’s mother had a wonderful experience with Southwest. This one is an example of really good customer service that every company should provide. KROSS is a polish company that manufactures bicycles and bike frames. It also walked some extra miles for its customers. 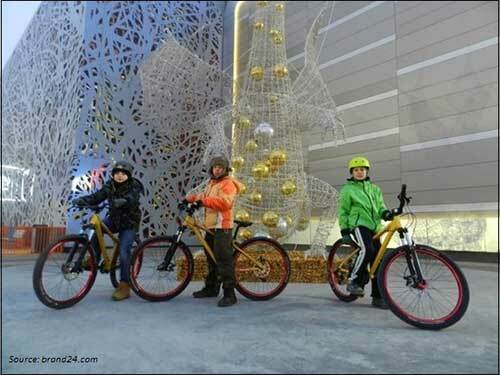 Three very young boys decided to save money for their dream bikes. To earn money, they used to offer help to their neighbors like cleaning the trash, shopping for groceries and in exchange they used to get small tips. KROSS came to know about their dreams and decided to make it true. KROSS gifted new bikes to all of them. Do you know any other examples of excellent customer service? Share with us in the comments section.